Founded in 1970, Providence Day School (PDS) exists to inspire in its students a passion for learning, a commitment to personal integrity, and a sense of social responsibility. PDS is an independent, college-preparatory school serving grades TK-12 on a single-campus located in Charlotte, NC. Within our rigorous curriculum, we also understand the need for play, socialization, rest, creativity, and experiential learning. We truly value family and work ceaselessly to build meaningful, life-long connections with our parents, alumni, grandparents, alumni parents, and other supporters. Providence Day School prides itself as a global school, focused on developing successful and responsible global citizens. Our Global Studies Diploma Program, the first of its kind in the country, allows students in grades 9-12 to choose a curriculum and set of experiences that lead to an additional Global Studies diploma. Our teachers are also afforded the opportunity to travel abroad and earn a Global Educators Certificate. The PDS Makerspace is a room dedicated to tinkering, designing, building, prototyping, and fabricating. It is a drop-in project space that students grade 6 and up use before school, after school, during lunch, and during study halls. Student projects center around 3D printing, electronics, digital design work, and basic woodworking. The space is a former classroom that has been changed into the workshop it is today with a pegboard tool wall, high shelves for private student project storage, rolling material storage racks, and whiteboard-topped tables. 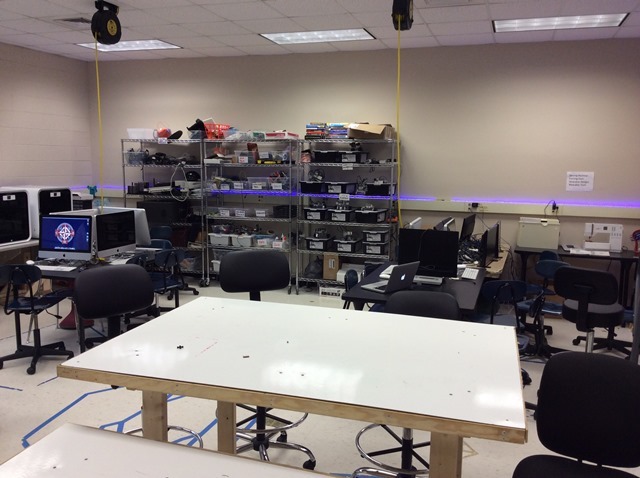 The makerspace is a drop-in project space that students in middle and upper school use during their free time. The space has materials and project topics ready, but also the flexibility to undertake complex student generated ideas. The space is also home to the robotics classes taught at PDS. These classes benefit enormously from the making atmosphere, creating mazes for the robots to complete from wood and cardboard. The space is used by after-school programs such as FLL and eCYBERMISSION for planning, testing, and prototyping. Faculty members will also look to students in the makerspace to create or design solutions to real problems on campus. The space changes function for the project size, group size, and scope. There are many students that work alone on complex projects. These students will draw inspiration from ideas that they’ve seen in the media and their peers. Large group projects are also fairly popular, often related to an after school activity. The groups not only learn about planning and design work, but also gain valuable experience working as part of a team. Probably the most popular use for the space is tinkering and exploration. Students will come into the space wanting to learn about 3D printing or Arduinos. They will get paired with a student that has just recently learned about their interest, collaborating and testing the new technology together. The next step is going to be campus wide design challenges. These challenges will be open-ended, specific to a type of construction, and useful as an end product. The students will be asked to work in teams to complete the design work for the challenge. The teams with the top designs will prototype in the makerspace. As a K-12 school, it is also important to connect the space with lower school. Another next step will be to invite classes of younger students into the space to do a design lesson using the tools and materials in the space.